If you are already registered for Cricket Web Fantasy Cricket then you are automatically registered for CW Games as it uses the same login system. Cricket Web have been working on a special treat for our members in the form of a cricket game section. 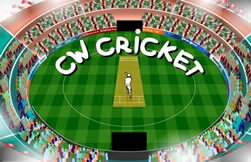 There are the old classics such as Hangman, Memory ,Crosswords and Quizes to keep your brain busy but the jewel in the crown is Cricket Web’s custom-made arcade cricket game named CW Cricket built just for you! In the feature rich game you can play a quick five over slog or take your team through the rounds to lead them to the silverware and another trophy for the cabinet. Also available is the multiplayer option where you set your friends a score to beat and then brag to them when they fall short. So pad up and get out in the middle and see if you can post the highest score on our leader board for the whole world to see just how good you are! We appreciate all the support you have given the site over the years and hope you enjoy the latest additions, but we never stay still for long so keep an eye out for new exciting additions to different areas of the site in the coming weeks.